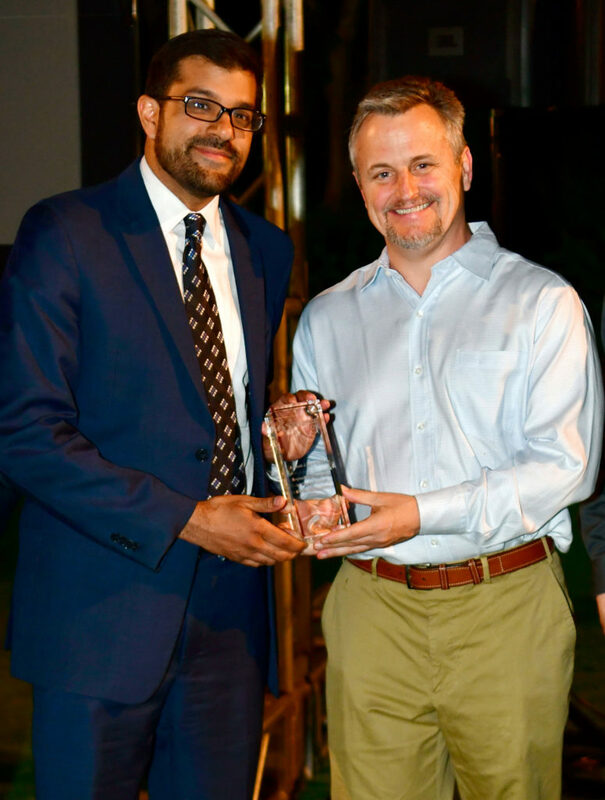 Osamah J. Saeedi, MD, Associate Professor and Director of Clinical Research at the University of Maryland School of Medicine’s Department of Ophthalmology and Visual Sciences in Baltimore, MD, USA, receives the 2018 Xtreme Research Award from Christopher A. Girkin, MD, MSPH, EyeSight Foundation of Alabama Endowed Chair; Chairman, Department of Ophthalmology, School of Medicine; Chief Medical Officer, Callahan Eye Hospital, University of Alabama in Birmingham, AL. Heidelberg, Germany – Osamah J. Saeedi, MD, Associate Professor and Director of Clinical Research at the University of Maryland School of Medicine’s Department of Ophthalmology and Visual Sciences in Baltimore, Maryland, USA, received the award for his in vivo imaging of ocular blood flow. Dr. Saeedi presented a lecture entitled “Beyond Angiography: In Vivo Imaging of Ocular Erythrocytes” at the award ceremony, held during ARVO’s Annual Meeting in Hawaii. The groundbreaking research for which Dr. Saeedi received the Xtreme Research Award is based on a novel technique that allows for labeling of individual erythrocytes (red blood cells) with the fluorescent dye Indocyanine Green (ICG). This technique, combined with dynamic confocal scanning laser imaging, offers the ability to visualize and potentially quantify ocular blood flow in a more granular fashion than ever before. While this research is still in early stages, the dynamics of individual erythrocytes may reveal undiscovered information about the physiological and biological processes at a cellular level within the eye. “These new discoveries may shed new light on important aspects of ocular hemodynamics such as oxygenation and flow speed, allowing for improvement and/or validation of technologies such as OCT angiography*,” said Ali Tafreshi, Director of Clinical Research at Heidelberg Engineering. This technique, referred to as erythrocyte-mediated angiography (EMA), is based on the innovative approach of labeling individual red blood cells with the ICG fluorescent dye and then reinjecting them back into the body to enable acquisition of angiograms of the eye. When combined with the video angiography functionality of the SPECTRALIS HRA imaging platform, this novel labeling technique offers the ability to dynamically visualize and monitor the movement and pausing of individual red blood cells in vivo. Dr. Saeedi’s work intends to facilitate a better understanding of the biological processes associated with ocular hemodynamics in a way that incites the identification of new biomarkers for ocular diseases such as glaucoma, AMD and diabetic retinopathy. Although Dr. Saeedi’s main area of interest is glaucoma, his research is laying the groundwork for future studies that may reveal new and important diagnostic parameters for ocular and even systemic diseases. Current ocular blood flow imaging techniques are limited in the amount of information that they offer. Conventional dye-based angiography imaging methods are able to visualize ocular blood flow dynamics only in the initial vessel filling phase. Dye-based angiography also mainly offers only 2-dimensional visualization of vasculature. While a new imaging technique, referred to as OCT angiography*, provides non-invasive 3-dimensional visualization of vessel networks, it currently does not offer dynamic information relevant to disease diagnosis. Doppler OCT has been investigated for quantification of ocular blood flow, but this approach has yet to be proven as a reliable and feasible in vivo imaging technique. The novel technique established by Dr. Saeedi may trigger the evolution of studies to evaluate ocular hemodynamics in a more refined fashion than existing methods, addressing some of the current key limitations in this area of research. *The SPECTRALIS OCT Angiography Module is available only in certain countries. It has not been cleared by the FDA for use in the United States. Check with your country’s contact person for details on local availability.